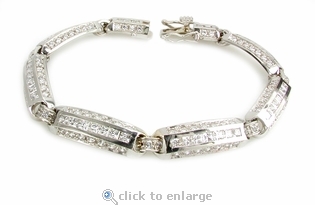 The Linkage Channel Set Princess Cut and Round Cubic Zirconia Unisex Bracelet is an inspired masterpiece by Ziamond. 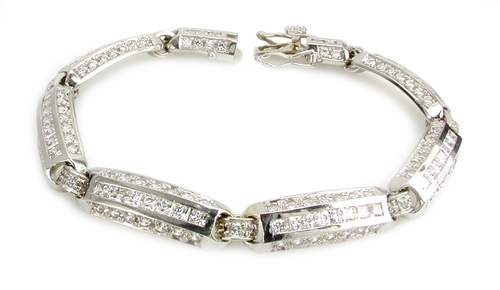 Each link features a single row of channel set princess cut diamond quality stones that are accented with a single row of pave set cubic zirconia rounds on each side. As an additional surprise, each link is connected with a small pave set cubic zirconia jump ring that adds even more brilliance. Each link measures approximately one inch long. 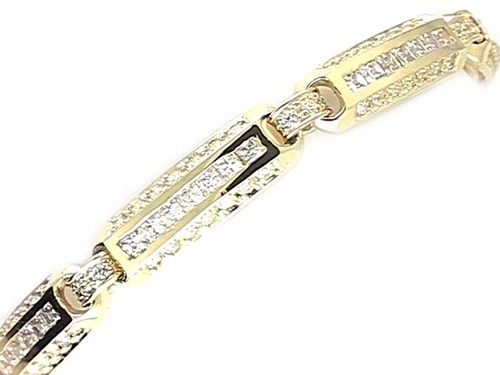 The bracelet includes approximately 14 carats in total carat weight of the finest hand cut and hand polished original Russian formula cubic zirconia and measures approximately 8mm in width. It has a double figure eight safety system and a cleverly integrated male/female clasp. This bracelet will amaze you. The Linkage Bracelet comes standard 8 inches in length. Longer and shorter lengths are also available in addition to a variety of stone colors that include man made ruby red, sapphire blue, and emerald green, in addition to lab created canary yellow, pink or diamond look cubic zirconia. For further assistance, please contact us directly at 1-866-942-6663 or visit us via live chat and speak with a knowledgeable representative.